Most predator callers would love to hang a wolf rug on the wall. This year, they may get the chance. For the first time, public hunting will be allowed in Wyoming, Wisconsin and Minnesota. Montana and Idaho are holding their third public hunts and welcoming nonresidents with low license costs and permit fees. Michigan officials are working on plans for a first season in 2013. Clearly, wolf hunting in the lower 48 is still in its infancy, due at first to a scarcity of wolves and then to federally mandated protection for the species. It’s going to be interesting. I’m betting the wolves more than hold their own, and we are going to have wolf hunting for a long time to come with more liberal seasons and less restrictions as officials realize what they are dealing with here. While wolves may be the ultimate trophy for predator hunters, it’s because they also are the ultimate predator, and current wolf populations must be reduced—quickly—to conserve elk and other big game. Hopefully, that’s not just wishful thinking on my part. The wolf has an aura that encompasses not only hunters but nonhunters and anti-hunters alike, and therein lies the problem facing wolf management in the lower 48. I and almost every hunter I discuss this with agree that the wolf may occupy a limited niche in the West and in the northern tier of some eastern states, alongside coyotes, fox and other smaller predators. However, the general public’s love affair with the wolf has gotten in the way of any reasonable management that might have kept the wolf in that niche. People who deal with wolf problems on a daily basis usually take a much harder stance. In the American West, the divide has grown bitter and deep. What has become known as “the Western wolf wars” began a generation ago when U.S. Fish and Wildlife Service biologists began capturing and releasing Canadian wolves in the Yellowstone region of Wyoming and wilderness Idaho. The idea was to reintroduce wolves into this historic range, providing hunters and non-hunters alike an opportunity to experience a different breed of wildlife up close and personal. It was promoted as a way to boost employment in the tourist industry and revenue for a host of businesses and enterprises. There would be no adverse effect on the other wildlife that supported the region’s already thriving hunting and tourism businesses. After all, these species had evolved in harmony with the wolf, which had only recently been eradicated from the region. But there was a small—no, make that large—problem with this thinking. The prairie wolf that originally inhabited the territory topped out at about 100 pounds and had evolved as a scavenger that cleaned up the dead and dying from thundering herds of buffalo and other abundant species. But the Canadian wolves that were brought in to fill that vacated (and some might argue no longer existent) niche weighed up to 140 pounds and had evolved in the Northern forests, surviving in formidable packs that killed pretty much any critter that crossed their path. In 1994-1995, when the first Canadian wolves were released. A stable herd of more than 20,000 elk roamed the Yellowstone region. Today, just 17 years later, there are less than 4,000 left. Once-thriving elk herds in Idaho, Wyoming and Montana have been devastated in similar fashion. The wolves were simply not the same wolves that were supposedly being “reintroduced.” It still might have worked if wildlife managers had followed the original plan with a target of 300 wolves with 30 breeding pairs in the region. But every effort to manage wolf numbers was thwarted with lawsuits and legal maneuvering by pro-wolf groups who milked a gullible public for donations to “save the wolf” while at the same time gaming the legal system for government reimbursement of outrageously inflated legal fees. By 2010, an estimated 1,700 wolves roamed the northern Rockies, and a survey estimated those packs produced approximately 200 pups that spring alone. And those numbers were admittedly conservative at-least estimates. People dealing with the wolves on a daily basis contended that actual wolf populations may have been double the estimates. Don Laubach, game-call maker and long-time resident of Gardiner, Montana, has been following wolf reintroduction since its inception. He said the situation in some areas has become dire at best and irreversible at worst. A “predator pit” occurs when an overpopulation of predators puts such a drain on prey species that they no longer produce enough offspring to maintain their own numbers, and without immediate effective action, this can result in a downward spiral that swiftly eradicates local populations. According to Don, this has already happened with elk in the Yellowstone region, and unless wolves are hunted on a year-round basis, managed as the predator they are, the problem is only going to grow worse as the wolves move on to new areas, much the same as coyotes have expanded their range over the years. The upper Midwest states of Minnesota, Wisconsin, and Michigan also face an overpopulation of wolves, conservatively estimated at 3,000. And the same anti-hunting pro-wolf groups have hamstrung management up until now with lawsuits that have kept burgeoning wolf populations fully protected on the federal rare and endangered species list. The legal maneuvers are finally failing, and with management returning to the states, wolf hunting seasons are underway. And, fortunately, the situation does not appear to be nearly as dire as out West. The lay of the land and the prey species are different. The wolves in the region actually are native, and while they may be taking a heavy toll on livestock and hunting hounds, the wolves’ primary wild prey, the whitetail deer, is still flourishing. If wildlife managers attack the problem aggressively, a debacle like what is occurring in regions of the West may yet be averted. Which brings us back to the new seasons and the need for effective hunting to get a handle on wolf population growth. Like I already said, it won’t be easy. Human-habituated wolves around Ely, Minnesota, on the edge of the Quetico Wilderness Area, can be seen scavenging trash cans and taking handouts from tourists. These wolves have never been hunted, and they may be relatively easy targets the first day or two of this fall’s first wolf season. But you can bet the survivors are going to change their ways. I spoke with Robert Millage, the Idaho hunter who called in and killed the first wolf during Idaho’s initial wolf season. He spent a total of 30 days in the woods this past season, had a total of two wolf encounters and missed the only chance he had for a shot. He told me the hunting already has gotten much tougher. Idaho’s game and fish department may be seeing the light as they lowered the nonresident license fee and allowed up to five wolf tags for both resident and nonresident hunters this year. Trappers are also allowed five tags each. The 2012 wolf season is open all year. There is no quota other than to maintain the minimum number of wolves required to keep them from going back on the endangered list. Last year’s harvest was 255 wolves taken by hunters and another 124 by trappers. Montana set a quota of 220 wolves last year, and hunters harvested 166. Trapping was not allowed. Despite this harvest, studies indicated wolf numbers increased, so the quota was dropped and more methods allowed for taking wolves. Trapping is also allowed this year, but no snaring. 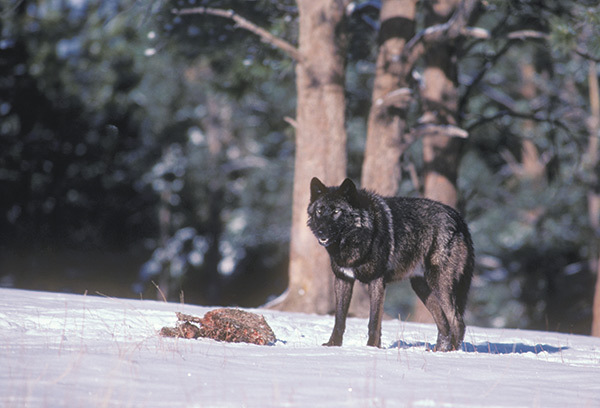 The Montana wolf season will stay open through February 28. Kill reporting is mandatory, to keep tabs on the harvest. Wyoming is hoping to open its first wolf season October 1 and run it through December 31 with a trophy hunt area near Yellowstone. A wolf license is required and a tight quota has been set. In the lower portion of the state, wolves will be managed as predators same as coyotes, with no license needed and no quota during a year-round season that never ends. The population of more than 3,000 wolves in the three upper Midwest states of Minnesota, Wisconsin and the Upper Peninsula of Michigan may support the best long-term hunting opportunity in the lower 48. Minnesota’s early season kicks off November 3 and runs through the end of deer gun season with a late season open November 24 through January 6. Wolf licenses were awarded on a lottery basis with 3,600 available for the early season and 2,400 for the late season. The combined quota for hunters and trappers over both seasons is 400, a conservative number that Minnesota sportsmen groups declared far too low. Resident wolf licenses cost $30 and nonresident $250. Trapping licenses are being offered to residents only at $30. Trappers are allowed to use snares as well as footholds, and hunters can use bait and electronic calls. Wisconsin wolf hunters also had to draw for a license. There are six wolf harvest zones with various quotas, but no more than 201 wolves may be taken statewide—a number not likely to have any great impact on growing wolf numbers. The Wisconsin hunting season will run October 15 through February 28. Night hunting and hound hunting will be allowed. If you really want to get a wolf this season, you might want to consider heading farther north. Canada and Alaska both have huge wolf populations with long-established hunting traditions. A number of outfitters in both places specialize in wolf hunting. In Canada, guides and outfitters use a combination of baiting and howling/calling with good results. If I was going on my first wolf hunt in the lower 48, I’d spend a lot of time researching the best locations. Most of the wolves that have been shot in western states the past couple of seasons have been targets of opportunity taken by hunters primarily pursuing other game. Wolves cover a lot of territory, and locating a pack to hunt can be a challenge. So can gathering good information where the locals don’t trust state or federal officials and don’t necessarily report wolf activity. You may want to take a trip to the area to make personal contacts and gather information for yourself. Herb Brusman, a long-time government predator control agent, trapper and outfitter, advises talking up as many sources as you can find. Call on local conservation officers, animal control agents, post office or UPS delivery men, and the local barber. Contact the chamber of commerce and ask for the names of ranchers who might welcome an experienced hunter’s help addressing wolf depredation problems. The closer you can pinpoint the location of a wolf pack currently working the area, the better. Baiting and calling are two of the most effective hunting methods (where legal; always check first). I’d look into the possibility of placing a bait or two on private land where I could control the situation. Working with a rancher or landowner who is having wolf problems may develop into a long-term relationship that benefits both of you. Baiting can be done effectively on small tracts of land, as long as you locate the bait off the beaten path where cagey wolves will feel comfortable and become accustomed to working it. In my limited experience hunting wolves up north, howling can work well with territorial pairs, if you can get within hearing distance. Herb Brusman, Bob Millage, and Mike Dillon of FoxPro Game Calls all endorsed the lone wolf howl followed by lots of patience. An hour or more on stand is not too long, and if you are getting any kind of response, wait ’em out. Where dates allow, spring denning season is probably the best time to con a wolf within range by howling and making use of wolf pup distress sounds. Wolves will not tolerate other wolves around their den site. I might also throw in some deer and elk calf in distress sounds. I’ve shot a number of wolves in Alaska with my trusty .220 Swift and never had one walk away. But all of the wolf hunters I spoke with recommend something a bit heavier, such as a .243, .25-06, and even a .270. If I go on a wolf hunt this year, I’ll likely tote my 6mm Remington.